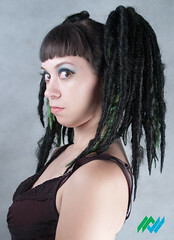 Above image is Jessica from the Cruxshadows modeling blonde clip-on backcombed dreads. Model Loan is wearing dread clips of a dark brown base with gold, black, and blonde mix accents. Dreads in the photo above are short clip in dreads base color black with baby pink, neon violet, and plum purple accents. Purple glitter beads added in small amounts. 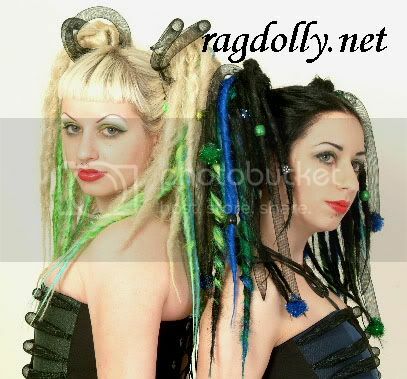 Above image is Alice and Amy of retroglam.net wearing clip on dreads. Alice (blonde) is wearing a short pair of dreads in blonde base with lime, light blue, and lemon lime accents w/ glitter beads. 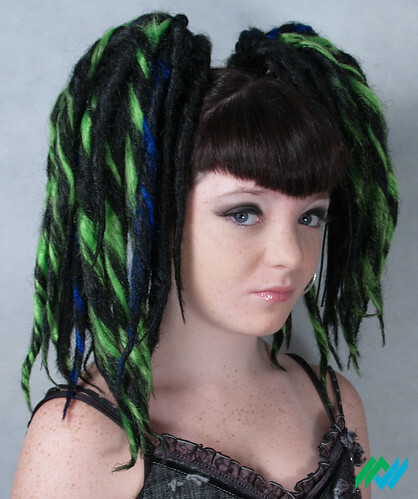 Amy (black hair) is wearing a pair of short dreads in black base with lemon lime, cobalt blue, lime, and emerald green accents (mesh tubes for added and glitter poms, as well as beads). These are thick backcombed dreads with tapered ends. Since they are mounted on a clip, there is maximum height (as seen on the model) and no fiddling with the dreads to make them look bigger and no bobby pins. Dreads are about thumb thickness, sometimes thicker. There are 20-25 dreads mounted on each ponytail ordered. For maximum height: clip over buns instead of ponytails. These dreads are massive and are guaranteed to give you big hair. If you fear big hair, then please email us to request skinny dreads. We can make those too! 1. Clip on in one second, no messing with bobby pins. 2. Maximum height and "big hair"
6. Hairpiece may be carefully removed from the claw clip and used as a drawstring bun cover. If you want a matching pair of falls, please order them both at the same time. If you order a single fall, and then order another later, it will not match. Please carefully make the decision if you are just ordering one fall, because we cannot exactly match it at a later date. There are only 3 fields for colors listed in the ordering drop-down menu, do not let this limit your creativity. Please fill out any additional (and unlimited) colors or requests in the comments section upon checkout, we will be happy to work with you to fit your needs. We do not charge additional prices for blends or swirls, they come included in base price. 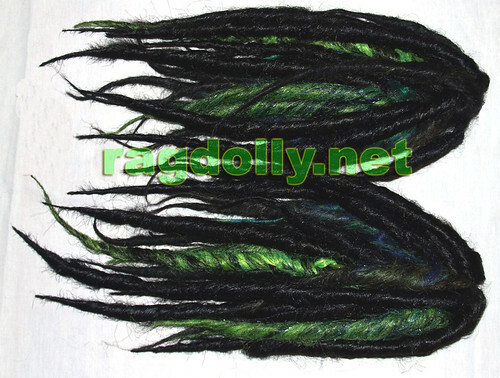 *This hairpiece includes 5 long dreads and 20 short to mid length dreads. Colors: Black base with accents in silver white. Shipping Time: Ship out within 5 business days after payment received. Colors: #613 blonde base color with accents in lavender (light purple) and light pink. We will be glad to add a few matching beads for free at your request. 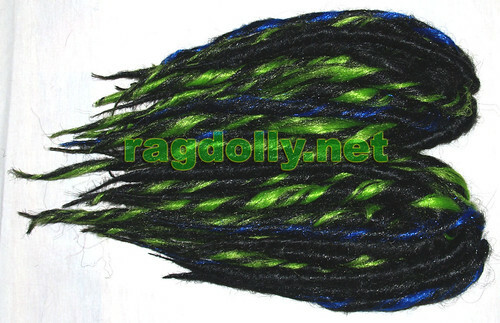 Colors: Black base with lime green (not UV reactive) and cobalt blue swirl accents. Colors: Black base with blended swirls of UV glow lemon lime, cobalt blue, lime green, and emerald green. Human hair tracks are also swirled into these dreads to make them more realistic.